According to a survey of 9,000 people from Clear Way Minnesota and Minnesota Department of Health, the statewide smoking rate has dropped to 14.4 percent, the lowest ever recorded and down from 16.1 percent in 2010. 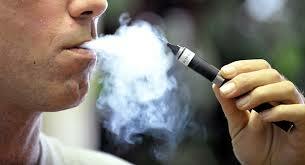 That number is also down a whopping 35 percent from the 1999 smoking rate of 22.1 percent. When asked what factor played an important role in helping people quit, the No. 1 reason was the increased cost of cigarettes. Minnesota’s state cigarette tax was raised $1.60 in 2013 and is one of the highest in the country at $2.83 a pack (only New York, Connecticut, Rhode Island, Massachusetts and Washington are higher). 63 percent of the survey respondents said the new price of cigarettes helped encourage them to quit smoking. 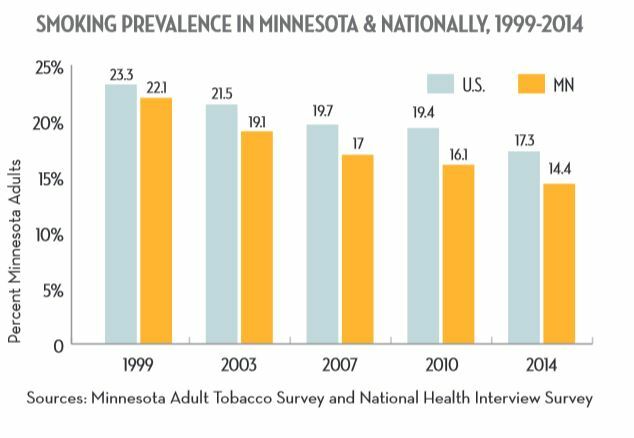 The survey also found that teens and young adults (18-24), the age group with the highest smoking rate normally, no longer as the highest smoking rate in Minnesota (likely because of e-cigs). Interesting info in the survey about e-cigarettes. The survey found that 66 percent of people reporting using e-cigs were also smoking cigarettes (telling me they were using e-cigs to get around smoking bans in workplaces, bars, etc.). 22.5 percent were former smokers while 11 percent were people (ie, kids) who had never smoked a cigarette. So, at least according to this one survey, fewer than one-fourth of the people using e-cigs used them as a smoking cessation tool, while over 10 percent were likely kids who had never smoked a cigarette in their lives. To me, that does not bolster the case for e-cigs well. real startling news that’s leading me to change my attitude about e-cigs. I’m sure it had the e-cig companies scrambling afterward. I think the message here is a lot is still unknown about e-cigs and the chemical compounds they release when liquid is heated into steam. They’re not completely benign and harmless, especially for kids finding a different delivery system to get hooked to nicotine. Formaldehyde is just one of many carcinogenic compounds found in cigarettes. Others include benzene, arsenic, vinyl chloride, Polunium-210, acetone, toluene and a bunch more. The New Orleans City Council Thursday night adopted — unanimously — a comprehensive smoking ban in the city. 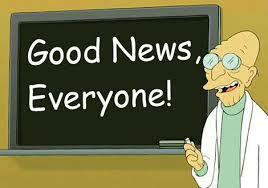 This is the first time I’ve written a post about the passage of a smoking ban in a long time. Pretty much everywhere that was going to pass a ban has already done it. Louisiana already had a ban on smoking in restaurants, but the New Orleans council went one step further and banned smoking in all nightclubs and bars. New Orleans was one of the largest cities in the country without a comprehensive smoking ban. (I think San Antonio is the biggest city without a comprehensive ban … the city has a ban, but it’s full of a loopholes, so it doesn’t count in my book.). There were some concerns during the council hearing that the new law could financially hurt city businesses. I would respond that the No. 1 industry in New Orleans is tourism obviously and most tourists are coming from areas of the country that already have smoking bans, so they are used to it. 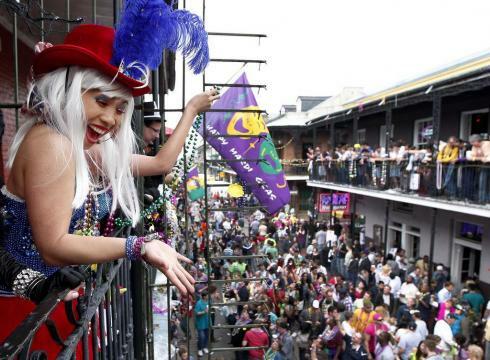 No one is going to stop coming to New Orleans because of a smoking ban. Here is an editorial from the New Orleans Times-Picayune hailing the vote. An interesting story. A bill is floating in the Kentucky State Legislature to ban smoking in all bars and restaurants. Kentucky is one of the few states left that doesn’t have a statewide smoking ban. All that being said … a Kentucky Health Issues poll shows that two-thirds of the people in Kentucky favour a ban on smoking in restaurants and bars. Sixty-six percent are in favour and 29 percent are opposed. Wow, in a tobacco-growing state with the highest smoking rate in the state. I suspect a pretty strong reason there’s such strong support for a statewide smoking ban is most of the larger cities and several other smaller towns in Kentucky already have smoking bans, so people are used to the idea. 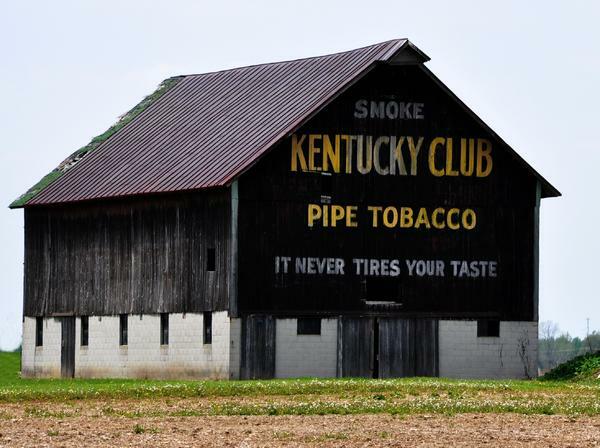 The three biggest cities in Kentucky — Louisville, Lexington and Bowling Green — have had total smoking bans for at least a couple of years. There simply aren’t that many places left in Kentucky where people can smoke indoors, at least in restaurants. Sure enough, the cities of Louisville (74 percent support) and Lexington (75 percent) had the most support for a statewide ban. In light of this poll, Kentucky House Speaker Greg Stumbo said it’s time for a House vote on a smoking ban. In previous years, proposed bans have not been able to get out of committee … to be honest, even with such overwhelming public support, there’s no guarantee a proposed ban will get to a House vote this year, not with the money and lobby power of Big Tobacco in Kentucky. Still, it’s encouraging and interesting how attitudes have changed about public smoking — even in Kentucky. 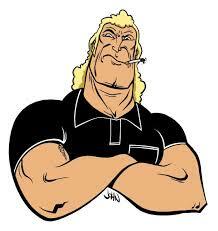 Brock Samson is a chain-smoking assassin and bodyguard character on the Venture Brothers. In fact, the Venture Bros. have a long history of making fun of smoking and cigarettes. In the new Venture Bros. special aired this weekend, I noticed that Brock no longer smokes. He was smoking an e-cig! I thought that was pretty funny. I didn’t like so much that it was a fairly blatant ad for Blu E-cigs, because it was obviously a Blu he was vaping. I don’t know why that cracked me up, but it did. I wonder when they decided that Brock should quit smoking, I haven’t watched the show much in the last couple of years because new episodes just became so spotty. Here are some various characters from Venture Brothers smoking over the years and smoking jokes on the show. The show airs at 11 p.m. and is geared toward adults. Trust me, the smoking is the tamest stuff on the show sometimes. 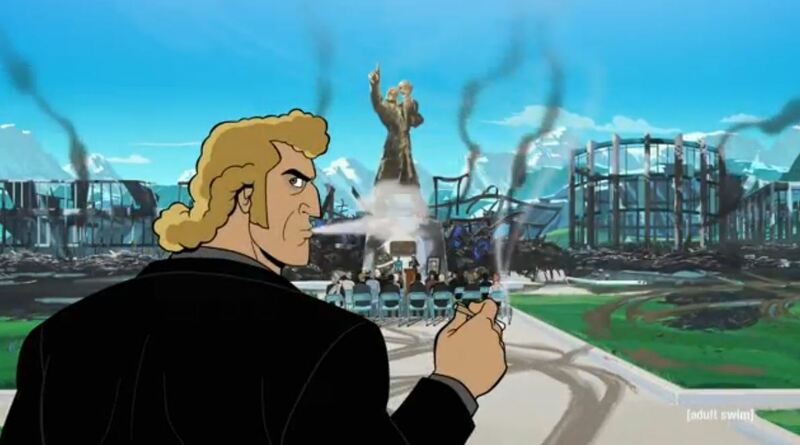 In the special epilogue of the Venture Brothers that you have to watch online, Brock Samson is back smoking.